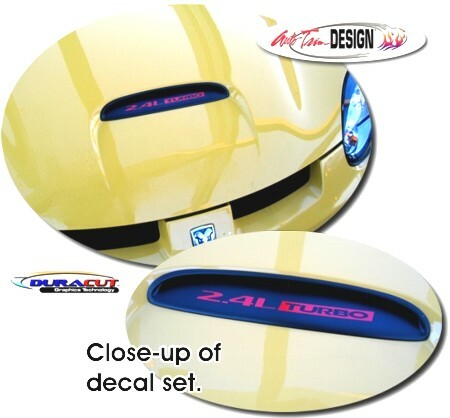 Enhance your Dodge SRT-4's plastic hood vent with these precut easy-to-install "2.4L TURBO" decals that uniquely fit within the existing factory lettering areas. Available in a variety of colors, these decals will set your ride apart from the rest! The decal is very easy to install and includes easy-to-follow online instructions. Get yours today! Please Note: Due to the fact that plastics tend to "out-gas" years after manufacture, we cannot provide a warranty for graphic/decal applications on such materials. Moreover, cleaning and surface enhancement agents with silicone additives may affect the adhesion of our decals if surfaces are not properly cleaned as per the instructions provided with the decal set.